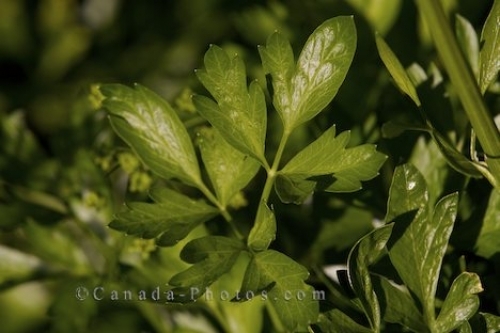 The healthy green leaves on the Italian Parsley on display at the Montreal Botanical Garden in Hochelaga-Maisonneuve in Montreal, Quebec. There are two varieties of parsley used for herbs, one being the curly leaf and the other being the Italian, both grown in the Montreal Botanical Garden in Hochelaga-Maisonneuve in Montreal, Quebec. The Italian Parsley has flat leaves which many find the flavoring to be considerably stronger than the curly leaf. Italian Parsley, Petroselinum crispum, Garden of Innovations at the Montreal Botanical Garden, Jardin Botanique de Montreal, Hochelaga-Maisonneuve, Montreal, Quebec, Canada. Picture of Italian Parsley thriving in the Montreal Botanical Garden in Montreal Quebec in Canada.